In 2013, we published Andy Singer‘s Why We Drive: The Past, Present, and Future of Automobiles in America. Part history, part original reporting, and part sharp, illustrated commentary, it tells a chilling story of why the US is the way it is. There isn’t any other book quite like this one, and we asked Andy to talk about it and his other work via email. Love what Andy has to say? Check out our superpack of his work. Why We Drive is a unique book, combining cartoons, text-form journalism, and photographs. How did it come about? After I did the book CARtoons in 2001, I got invitations to speak at various venues including The Village Building Convergence, bookstores and a few universities. Being a visual artist, I gradually developed a slide talk about the social, environmental, economic and political problems of transportation design in America. I used a mixture of cartoons, photographs and maps because I found it was helpful to give people real-world examples of good and bad urban design. When I got positive feedback from the talk, I became interested in turning it into a book and an interactive website. I still have to build the interactive website but Microcosm helped me create, edit and publish the book. My goal was to explain transportation design issues and politics in a simple way to college students and the general public, as well as put forward a few ideas about why I believe we’re not making more political progress at reforming our transportation system. 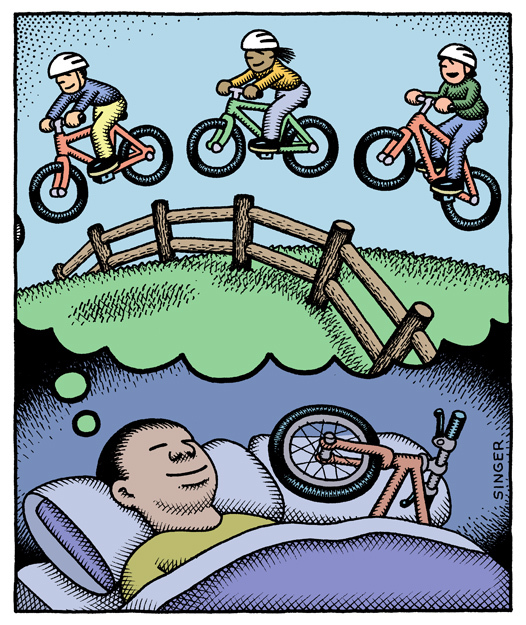 How did you start drawing cartoons about bikes, cars, and related issues? What was the first cartoon you made? I use cartoons as a way to experience and understand life, the way a writer might use words or a photographer might use photos. I make cartoons about everything—personal experiences, relationships, art, philosophy, politics, religion and anything else I am experiencing or thinking about. In college and after college I was trying to give myself as much time to draw as possible so I was trying to live as cheaply as possible. Not owning a car and getting around by bicycle and walking was part of that attempt to live cheaply. When I graduated from college, I sought out the cheapest rooms or apartments I could find. One of these put me next to a freeway interchange in Oakland California. The experience of living there, biking everywhere and reading the book The Power Broker by Robert Caro, changed my life and made me appreciate all the issues associated with transportation. I saw exactly how and why the freeway interchange gutted my neighborhood and how the main obstacle and danger to bicycling in urban areas was cars and drivers. This was the early 1990s when many people were waking up to these same issues. 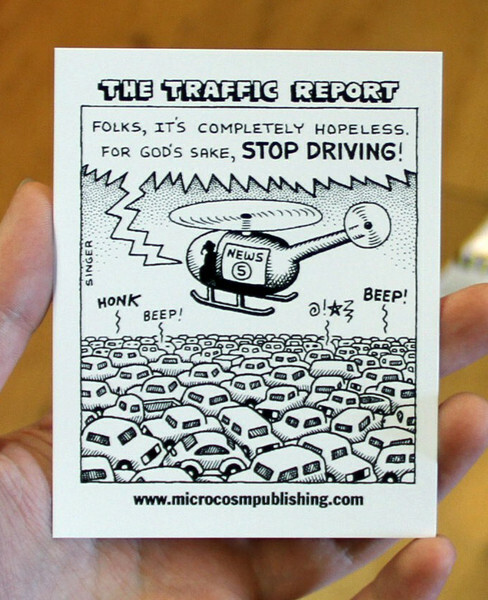 I participated in some of the first Critical Mass rides in San Francisco and the East Bay and started giving them my transportation cartoons for flyers and posters. I also discovered the (now defunct) “Auto-Free Times” and Alliance for a Paving Moratorium in Arcata, California and started sending them cartoons as well. By 1994 it had become a major theme in my work. Most people in the US still see bicycles as a sport or something kids do. Do you have a lot of awkward conversations about what your work is actually about? Not really. Most of my friends and family appreciate where I’m coming from. They’ve been around me and see how I live or have ridden bicycles in urban areas and appreciate what that experience is like. Also, everyone in America has driven somewhere and understands what driving is like. Because many of my cartoons are true to that experience, even most car-drivers will acknowledge the reality of what I draw. Now days, city planners, elected officials and many people in the general public are hip to these issues and trying to figure out how to make their cities less car-dependent or reduce the amount of driving in their lives. Since 2008, for the first time in American history, Vehicle Miles Traveled (the measure of how much we drive) has actually gone down slightly, despite an increase in the country’s population. So people are trying to drive less. Your work covers a lot of big issues like sprawl, climate change, transportation policy, pollution, economics… What can ordinary people with busy lives and not a lot of political access do to address this stuff? You can try to address it in your own life. You can try to set up your life so you have to drive as little as possible. In so doing, you vote with your feet and your wallet. When more people bike, walk and use public transit, there is greater pressure on elected officials and government agencies to improve these modes of transportation. It thus increases the profitability of public transit and makes cities more desirable places to live. It also helps reduce your carbon footprint and reduces the amount of money going to automobile manufacturers, oil companies and highway agencies. In a globally connected capitalist world, cities and countries are competing for highly skilled labor—programmers, engineers, scientists, etc. To some degree, these people can live anywhere they want. So San Francisco or my current city in Minnesota aren’t just competing with other U.S. cities but are competing with cities in Europe for the best and brightest talent. Polls and statistics show that more and more skilled people want to live in cities that are walkable, bikeable and have good public transit. Also our population is aging and realizing that they don’t want to be trapped in automobile-oriented retirement communities in Florida or the southwest USA. They also want improved walkability and transit. Finally, there’s been an explosion of obesity in the USA with resulting increases in healthcare costs. Many factors contribute to this but increased amounts of driving and a lack of daily exercise are major factors. City, state and business leaders in the US are increasingly aware of all this. It is part of Gil Peñalosa’s “8-80” message (the former parks commissioner of Bogotá, Colombia) and many other leaders. So how you live your life has an impact on the larger world. Driving less also frees up more of your time to do other things, like participate in the political process at both a local and national level—in school boards, city councils, planning commissions or even political campaigns. If you don’t have to spend two hours a day driving to work or driving your kids to school, you might have time to help organize a “safe-routes-to-schools” program in your school or get walkability or bikeability improvements to your neighborhood. One thing you realize from trying to reorient your life and get around using your own human power is that no one is going to help us or save us but us. It’s a do-it-yourself world. If we want to prevent environmental destruction, live better lives, get campaign finance reform, peace or justice, it’s up to us to organize and take action. We are the government and we are the world. 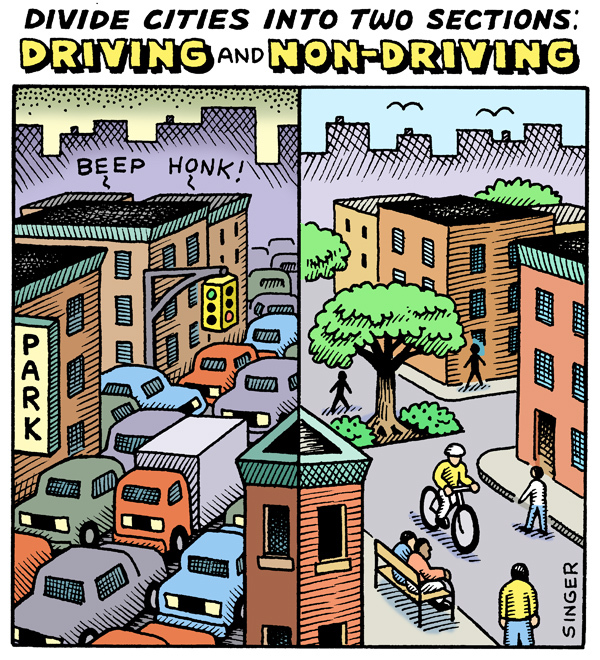 This has been an interview with Andy Singer, author of Why We Drive. It is one of a series of interviews with Microcosm authors. The last interview was with Lisa Wilde, author of Yo, Miss. The next one is with Crate Digger author Bob Suren.